I was approached by Max at Printed T-shirts and asked whether I would like one of their printed T-shirts to review for you guys. I thought the printed T-shirts website was really fun and the company has been voted Britain's favourite printed T-shirts website! 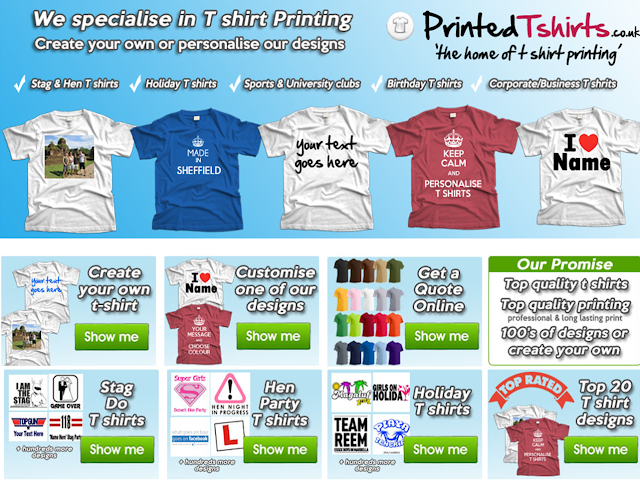 Printed T-shirts are a company based in Sheffield who design, print and create personalised and printed T shirts. They make perfect gifts as well as great items to wear for events such as birthdays, stag and hen do's, holidays away, business events and much more. They can tailor quotes to you and your needs. They aim for 100% happy customers and always make sure that you are satisfied with your t shirts. They can produce unique and unusual t shirts as well as traditional t shirts so email them to see what they can do for you today. They also let me design my own t shirt as well as many other forms of t shirts. They are there to help you create the best t shirts around and so you a free quote via email or through their contact form so you can get an idea of the cost. They produce all t shirts on high quality t shirts and aim for 100% satisfaction. I decided to go with my own designs and asked Max to print me a t shirt saying "I only Obey Christian Grey" as I am 50 shades of grey obsessed and I cannot wait for the film to come out! The T-shirt that Max sent me was of extremely good quality and had plain black text as I had asked him for. I know your all going to laugh at the T-shirt that I choose but I really liked it, and thought it would wind my house mate up as he hasn't read all of the books yet! Have you designed any of your own T-Shirts before? We have got thousands of ideas for what to print on your t-shirt. Signaturesx allows you to customize t-shirts using your own text, designs from our huge image database, or you can even upload your own photo or pictures. Visit our T-Shirt Designer where you can start designing your own shirt. You think it, we print it.